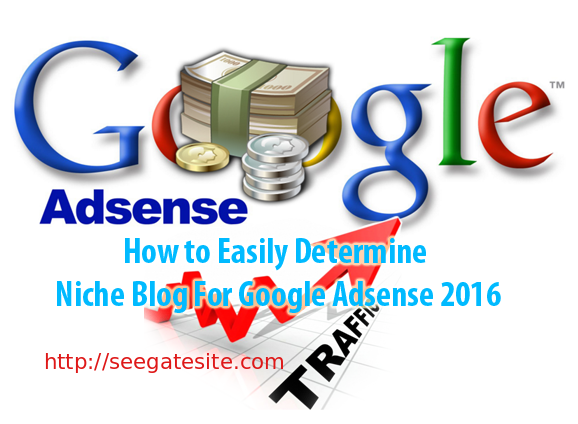 Seegatesite – The topic of my article this time about niche blog for google adsense. Every blog should have a clear niche to be liked by google. Create a blog should consider good maps in order to provide benefits to the blog visitors. Successful Blog necessarily meet various criteria. One of them has a specific niche blogs that are discussed. Many ways to define a niche blog for google adsense, especially for beginners. Along with advancement of age, all internet’s users either through a desktop computer or smartphone access the Internet to find a lot of information every day for themselves. If visitors get a blog with a specific niche on what is sought, certainly these visitors be comfortable and back again waiting for the latest articles. By relying on blogs with specific niche. A blog has a loyal visitor. Determine the blog’s niche is quite easy and can be done for all newbie. Don’t think too much about the new blog that you manage not getting visitors. If your niche is right and good, of course will get a good response to do advertising on google. Now you ask yourself. What became of interest / expertise during this time (eg interest about the world of blogging, traveling, insurance, healthcare, automotive, health, photographers and others – others). This is useful if you want to build a Niche Blog For Google Adsense and blog have a long life. Blog is managed in accordance with your own interests and expertise, certainly feels very comfortable to manage. You should do some research first before starting a blog. How big visitor attraction in specific niche you want to apply. It’s useful to know the niche so that you will be successful or be temporary in the future. Online news site gets a lot of visitors on daily basis. it never hurts to review one sub-topic of the main topics discussed the online news portal (eg fashion topic; you can discuss about celebrities). It could also be a reference to determine the right niche blog for your website. The way you can ask to forums that have the same niche or friends on social networks, what would you like to discuss in order to start a new blog. Then creating the list of the results of their opinion. If you have great interest and wide, create a mapping to shrink the niche you want to discuss more specific to the new blog. Mapping and planning well, one of the success factors so that your blog can compete to the maximum in the google search engines. Not too difficult to build a blog ranging from zero to success, if proper planning. Many other ways, which discusses determine niche blog for google adsense in 2016. Above tips can be applied if you want to create a new blog but could not determine the right niche. Especially for those who want to succeed with google adsense.